If you’re a trekkie, you know that Spock quoted this phrase (I don’t think he invented it) in Star Trek II: Wrath of Khan. Yes, I’m a trekkie. However, while this perspective might be true in Star Trek, it’s not the case when it comes to effective advocacy. Sometimes, the needs of the few outweigh the needs of the many. In Washington, DC the difference between a good cause and a special interest is simple: you agree with the policy perspective of a good cause and the other side is always represented by one of those horrible special interests. In truth, everyone has a special interest and hence everyone IS a special interest. It’s just that your special interest may be diametrically opposed to another’s. Or, more likely, others may not be convinced that your interest is in the best interest of everyone else. It’s not. That’s why it’s a special interest. If it were good for everyone it would be a common interest. The appropriations process best reflects this phenomenon. Many, many groups compete for funds for their favorite programs, whether it’s research dollars for a certain disease over others, infrastructure capital for roads versus public transportation or housing assistance for low income individuals versus overall urban development funds. Now, sure, many items that receive funding seem pretty far-fetched in terms of the use of taxpayer dollars. We’ve all heard of the infamous bridge to nowhere. But remember, one man’s pork is another man’s bacon. I recognize that citizens are frustrated because members of Congress sometimes vote in the interests of their district or state as opposed to the overall public good. But, frankly, that’s their job. Opposing a program that is clearly in the best interests of the area they represent on the grounds that it’s not good for the country is not only politically risky – it’s also not in keeping with their job description. And, believe me, people get pretty cranky about that. In my opinion, we must all give up the idea that every special interest is bad or unworthy because it doesn’t coincide with everyone else. Perhaps more important, you must recognize that other people may have good intentions, even when they disagree with you. As advocates, your job is to promote your special interest, without vilifying the interests of others, in adherence to the principles of honesty, integrity and ethics by which we all should live (or at least that’s what my mom says). Tomorrow is Thanksgiving, or, as I like to call it, “Fatty Pants Day.” That means it’s time to give thanks for all those things you take for granted on a daily basis, like a good pair of stretchy pants (and I suppose your family, friends, a roof over your head ... ). As you’re making your list of things to be thankful for (I’m not the only one that actually writes out a physical list, right? ), don’t forget to include your Members of Congress. Okay, maybe politics is the last thing you want to be thinking about on Turkey Day, but there’s an important lesson here. Advocates spend most of their time urging their legislators to take action on important issues (as they should), but you can get so caught up in the “ask” that you forget to appreciate what your Congressman might have already done to support your cause. Maybe in the past they voted with your issue or made a statement in support of your organization. When you’re building a relationship with a Member of Congress and their staff, “thank you” can go a long way. Just as you expect them to understand and appreciate the good work your organization is doing, you need to in turn recognize and thank them for their work on your issue, even if they aren’t one of the biggest champions of your cause. If the congressional office knows you took the time to learn their history on the issues, they will be more willing to return the favor, and that’s an important part of building a relationship with that Member. I officially pardon you from your tireless advocacy endeavors for tomorrow, but once you wake up from your tryptophan coma and the holiday is over, remember to start thanking your legislators! Debt "Supercommittee" is hitting a deadlock dangerously close to their deadline. Next week is the deadline for the Joint Select Committee on Deficit Reduction to come up with a plan to reduce the federal deficit by $1.2 trillion over the next ten years. After a week or two of hopeful momentum on reaching a deal, including proposals from the two parties that only differ by $100 billion on taxes, negotiations have stalled once again. Formal legislation must be introduced by November 21st and voted on by November 23rd. The main points of contention between the Republicans and Democrats on the committee are changes to Medicare and tax revenue increases. Last week Democrats said they would be willing to go as low as $401 billion in new revenue, while Republicans indicated the highest they were willing to go up to is about $300 billion. They differ on the types of tax reform that would generate this revenue. This week we are hearing more bickering than negotiation, more blame game than end game. While it is unclear whether the committee will be able to reach a deal in time, all hope is not lost. It certainly wouldn’t be the first deal struck at the last possible minute this year—the very Budget Control Act that created this “Supercommittee” and raised the deficit ceiling was passed just hours before the U.S. government would have defaulted on its borrowing authority. Congress also narrowly avoided a government shutdown back in April when they couldn’t agree on how to fund the remainder of Fiscal Year 2011. If some of you responded with “… What? Seriously?” don’t feel too bad. This is an off-year election mostly comprised of mayoral elections and ballot measures (there are only 4 states holding state-level legislative elections and only 2 states holding gubernatorial elections). The most exciting coverage of the day is related to some of the more contentious ballot measures, such as a vote in Ohio on a measure that restricts the collective bargaining rights of unions and whether the state of Mississippi will essentially outlaw abortions entirely by passing a measure to define a fertilized egg as a person. While only a select few issues are getting lots of national attention, there are plenty more being voted on today that will have an impact at the state and local levels. This reminded me that it’s extremely important to advocate for local issues as well as national. A lot of us tend to focus on the “big picture” and forget that sometimes the best strategy is to build your way up from the bottom. Fighting for issues that are important to you at the local level not only directly affects the people in your community, but victories can also give you sway at the national level. If you can go to your Members of Congress and say “Look, people supported this and passed this legislation in your community, and see how much good it did,” your persuasive arguments become less theory-based and more evidence-based. And if there’s anything legislators love, it’s actual evidence of something working. It makes their job a lot easier when fighting for legislation if they can offer up specific examples of how that policy or program is benefiting their constituents. If your efforts are entirely focused on national policies, consider adding this strategy into your advocacy arsenal. It will probably add a lot to your workload (Who doesn't love more work? ), but it can be well worth it. Over the weekend, an article in the Washington Post pointed out that the next Presidential election is just one year away and, get this, Americans are disappointed in the current performance of our government. Yes, I know you turn to this blog for the latest and greatest news. In fact, with record unemployment and job disapproval ratings, Obama faces the most difficult re-election challenge of any incumbent president for the last two decades. Fifty-three percent of Americans disapprove of the job he is doing overall, and 61% disapprove of the job he is doing on the economy. In general, you'd probably imagine that the other side of the aisle feel pretty good about these numbers. However, a couple other statistics jumped out at me. First, 50% of respondents agreed with the statement that Obama is making a good faith effort to deal with the nation's problems, but the Republicans in Congress are playing politics. That compares to 37% (for the comparable questions) for the first President Bush at around the same time in his campaign for re-election. Americans blame the Republicans in Congress more than Obama for the state of the country. Almost 60% of respondents are likely to not automatically vote for their current member of Congress and, instead, look around for another option. By a slight margin, more Americans want the Democrats in control of Congress after the next election. Perhaps most disturbing, aside from what the White House or Congress is doing, seventy-four percent of Americans think that things in our country have gotten pretty seriously off track. I'm always a little skeptical about that question because I'm not sure of these "things" of which they speak, but I do know that's not a good number (you can read current polling results here). The main message from the polls are, of course, that voters aren't really all that happy with what's going on in the country and, sadly, I see that more and more people feel like they can't do anything about it. Here's the thing, though -- you CAN do something about it. You can find my checklist for effective advocacy here, as well as some articles on effective advocacy here. Or join my advocate chat hour at 2:00pm eastern on Wednesday November 9th. Just go to http://www.join.me/ and type “advocacyguru” (no quotes) in the join box. Then click on the bubble to chat. It’s all free. Seriously, I want to help you feel better about government, or at least know your voice can be heard. We all enjoy a little drama in our lives, but keep it separate from your advocacy. The months leading up to a Presidential race are always rife with controversy and scandal. A little financial frivolousness here, a little sexual harassment there … there always seems to be plenty to go around. If there is one lesson a person running for public office learns quickly, it’s that your past can come back to haunt you. Well, the same goes for any grassroots advocacy campaign. Like any business’ or individual’s venture to gain support from the masses, it’s extremely important to maintain a clean track record. And for those of you thinking that a little controversy can be good because it equals free publicity, cut it out. That may work for celebrities, but it will not advance your advocacy initiatives. Take ACORN for example. The Association of Community Organizations for Reform Now was one of the largest anti-poverty groups in the nation (until it filed for bankruptcy last year), working to improve working and living conditions for low-income Americans since 1970. While they achieved many victories at the local, state, and national levels, that is unfortunately not the first thing that comes to mind for the average American. Instead, the first words that pop up are usually “voter registration fraud,” which ACORN was accused of during the 2008 Presidential campaign. The aftermath that occurred as a result of this controversy inevitably contributed to their downfall. Now this is an extreme case—it received so much media attention because it was wrapped around the Presidential race. But it’s still an important lesson for any grassroots organization, no matter the size and scale. A scandal may not mean bankruptcy is in your future, but it could cause you to lose supporters and diminish your ability to create policy change. If you stay true to your cause and never waiver from your morals, you can build and maintain a truly strong movement. Okay, I know that last part was a little cheesy and fortune cookie-ish … but it’s true! The 2012 Senate Calendar has been Released! 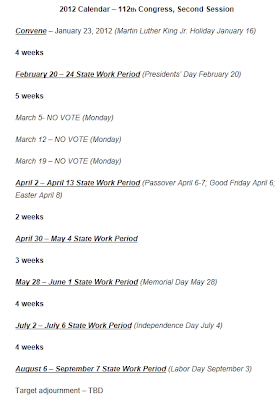 Last Thursday, the House Majority leader released the 2012 calendar for the House of Representatives. 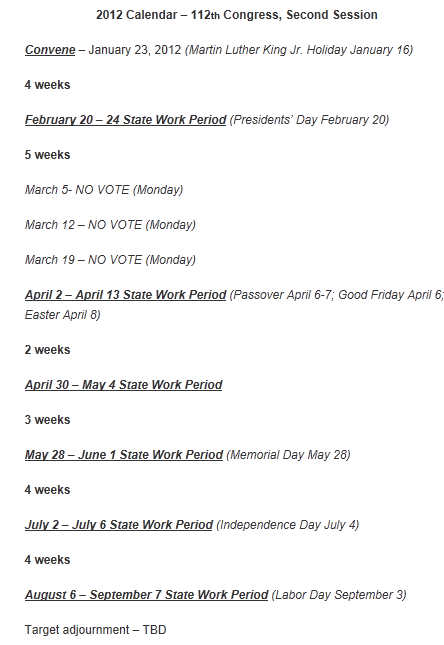 Yesterday, The Senate majority leaders released the 2012 Senate calendar. Now that both the House and the Senate calendars are available, you organization can decide which days to would be most effective to have a Lobby Day.